Objective: In the present study, the utilization of a novel biocompatible and biodegradable Methotrexate controlled release injectable formulation is established. The drug delivery vehicle used is an autogelling pH sensitive formulation, which is based on the natural biopolymer chitosan. Methods: Chitosan/glyceryl monooleate (C/GMO) solution was prepared in 0.33 M citric acid with gentle stirring. The weighed quantity of Drug and Chitosan in the required concentration was stirred with an appropriate quantity of 0.33 M Citric acid for 3 hours. Further, this solution was cooled to 4oC. Then, to this cooled Chitosan and Drug solution, the desired amount of Glycerol Monooleate was added dropwise with constant stirring to obtain a clear homogenous system. Moreover, it was filtered by membrane filtration using the cellulose membrane. Finally, the prepared pH sensitive formulations were sterilized by autoclaving. 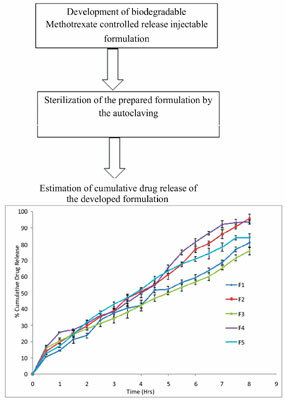 Results: The drug release of the final formulation as cumulative percent drug release was found out to be 80.93%, 95.78%, 75.86%, 93.58% and 84.10% for formulation F1, F2, F3, F4 and F5 respectively after 8 hours. The in vitro drug release study had shown that the formulation F2 had better-sustained effect than other existing pH-induced formulations. Conclusion: All these findings showed that chitosan/GMO gel was found to be safe, effective, homogeneous and stable injectable formulation for sustained delivery of Methotrexate and presented an approach for the striking technology offering the platform for the delivery of other clinically significant anticancer drugs. Anticancer, hydrogels, pH sensitive, release, kinetics, methotrexate.